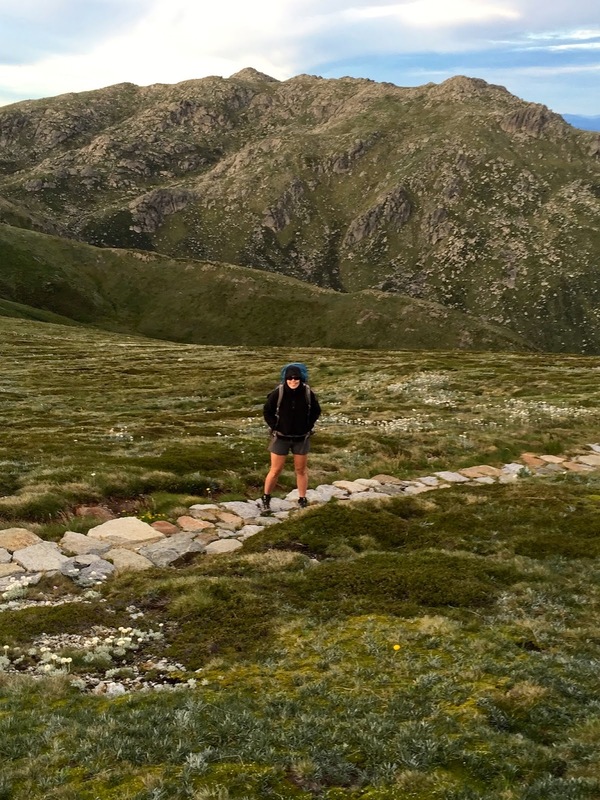 I have heard some writers and journalists describe Mt Kosciuszko as 'uninspiring'. 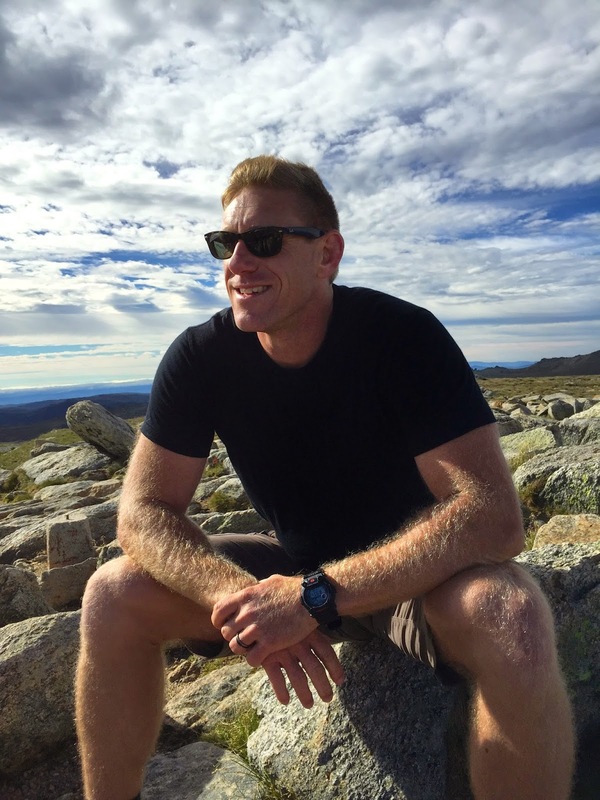 I found the highest point on the Australian mainland stunning. The hike to get there a remarkable walk. We departed from Newcastle a little rushed. It was already after 9.00am and we had a full days drive ahead of us. 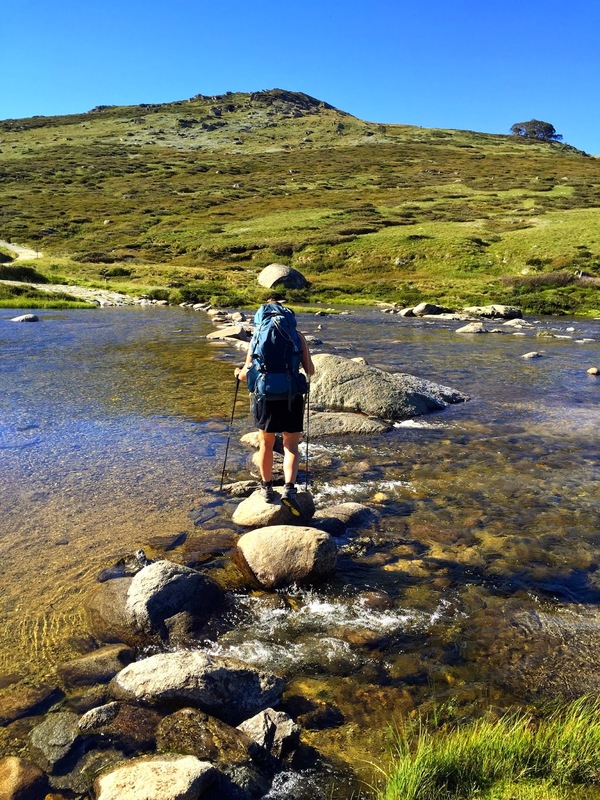 Though we allowed ourselves plenty of time to complete the hike I have never seen Mt Kosciuszko and its surrounds and hate to be rushed on such adventures. 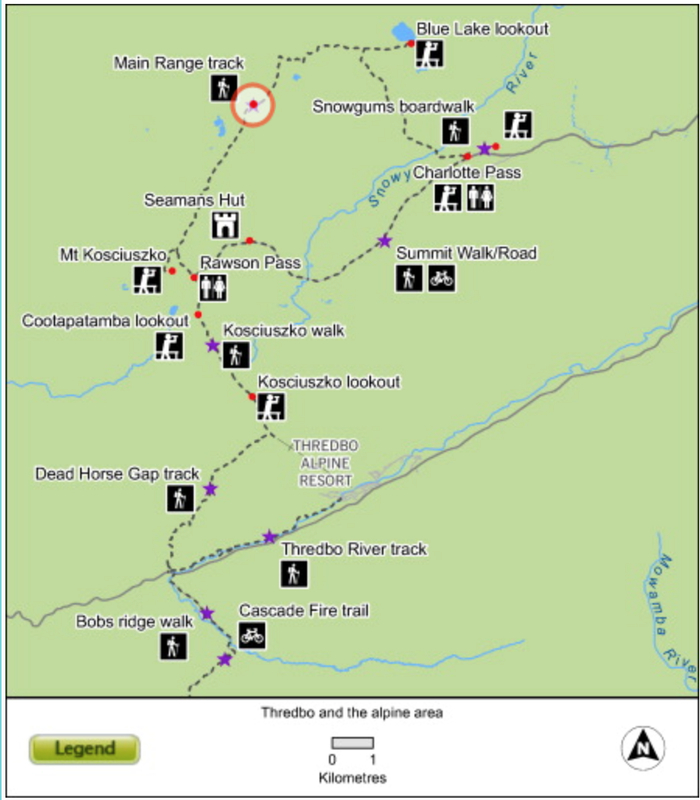 The Main Range trail head is located on Kosciuszko Road. 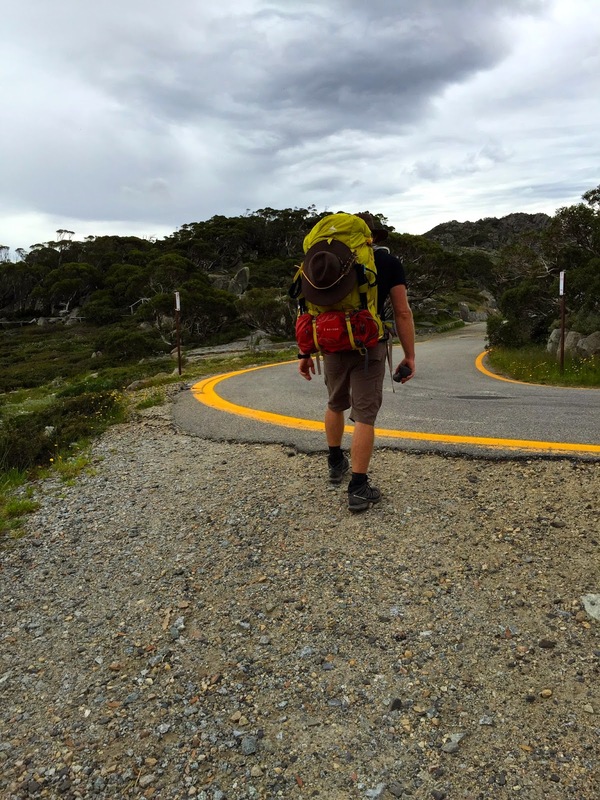 From Jindabyne it is a simple matter of following this road to its very end and parking outside the 20 minute area. For this particular National Park there is a charge of $16.00 per night for the car. We arrived at 5.30pm after an uneventful trip. The day is sunny with a light breeze and ideal for hiking. 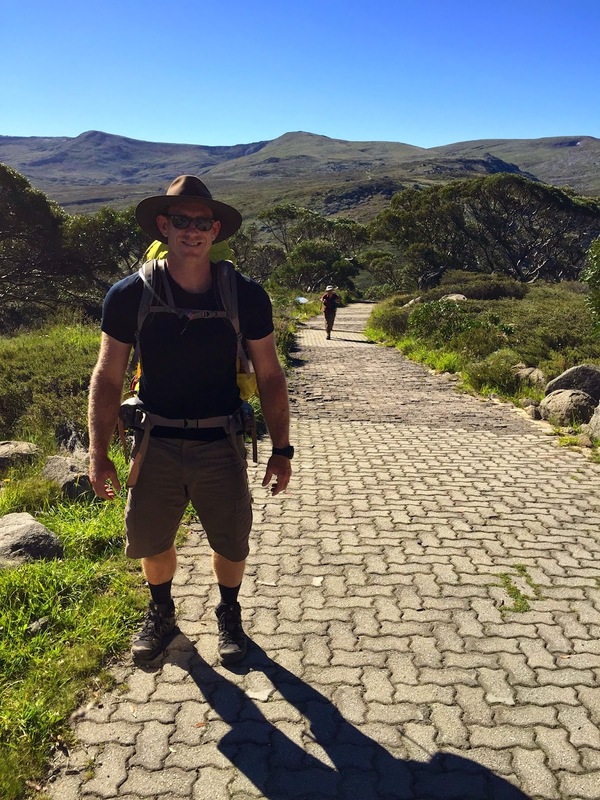 We set out intent on putting a few kilometres behind us before sunset. 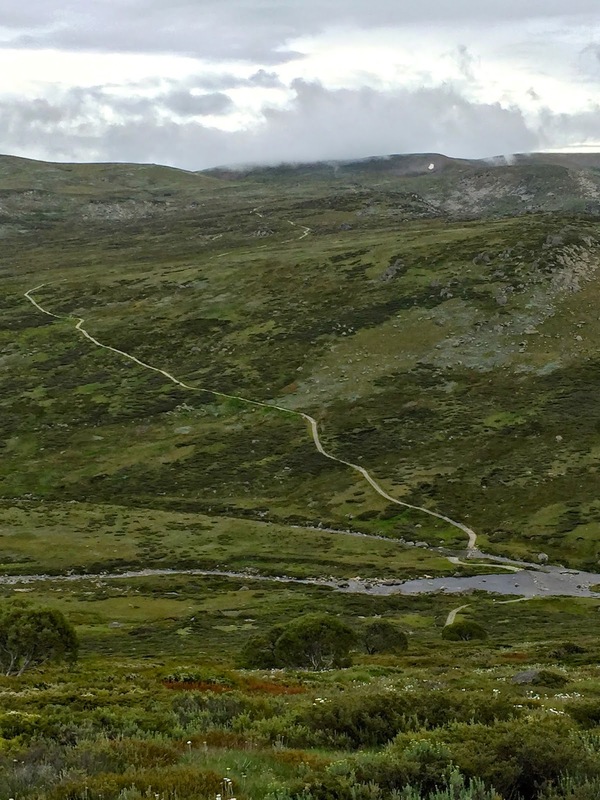 The Main Range trail drops down to the Snowy River before climbing back onto the ridgeline which eventually makes its way to Mt Kosciuszko. 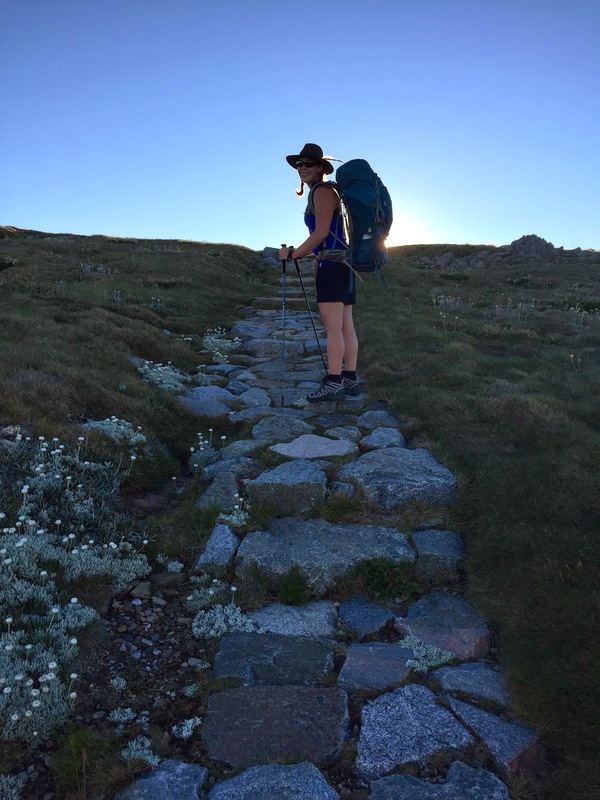 The trail itself is a return trip but once off Mt Kosciuszko you can make it a circuit by heading back to Charlotte Pass via the Summit walk. We departed with a spring in our step. I have only seen pictures of this sparse landscape and I was impatient to see it for myself. 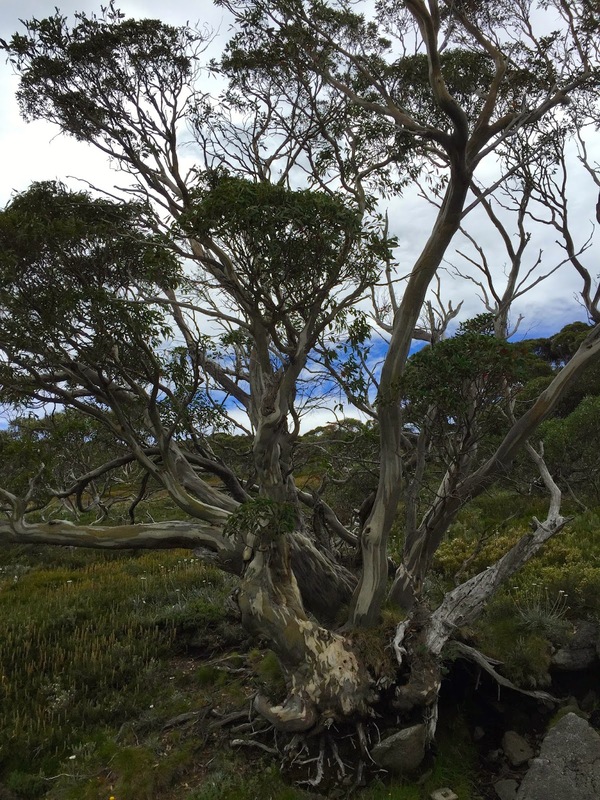 More accustomed to the tall straight eucalypts of the National Parks in New England I was struck by the twisted stature of the snow gums that hug the steep path down toward the Snowy River. Whatever harsh conditions nature throws at these stunted eucalypts they seem up to the challenge. As is the way with nature. 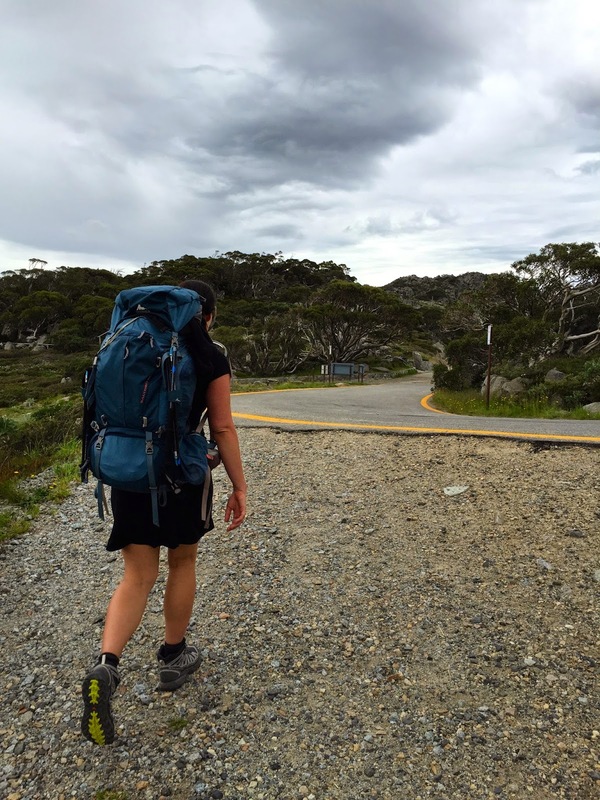 The Eucalypts disappear dramatically and the trail opens up. I am suddenly aware that the beauty of this region lies in its sparseness. There is no sign of trees and the vegetation is low and hardy to suit the cold winters. With the high peeks and steep valleys you can see for miles. I feel somewhat small and insignificant. Rather humbled by the surrounds. I heard the Snowy River before I saw it. 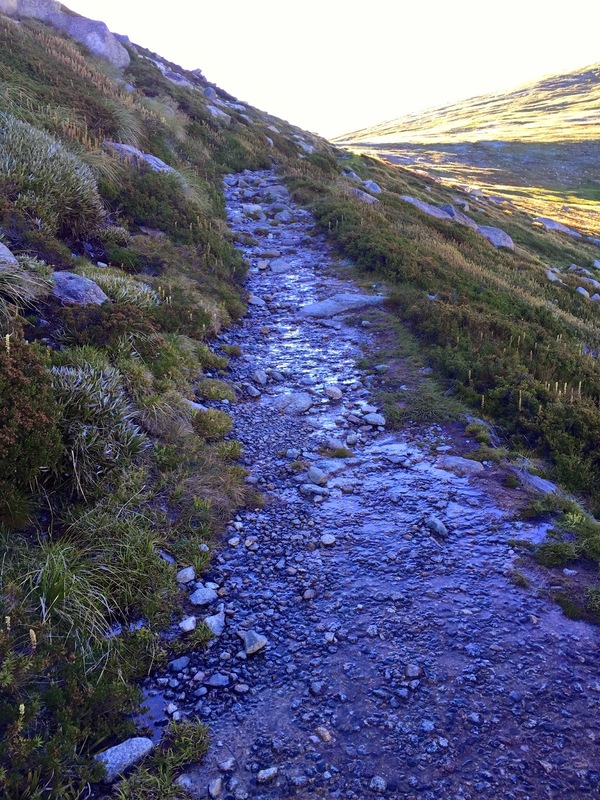 My eyes followed the trail down as it descends to the bottom of the valley. A shimmering snake that winds its way off into the distance. 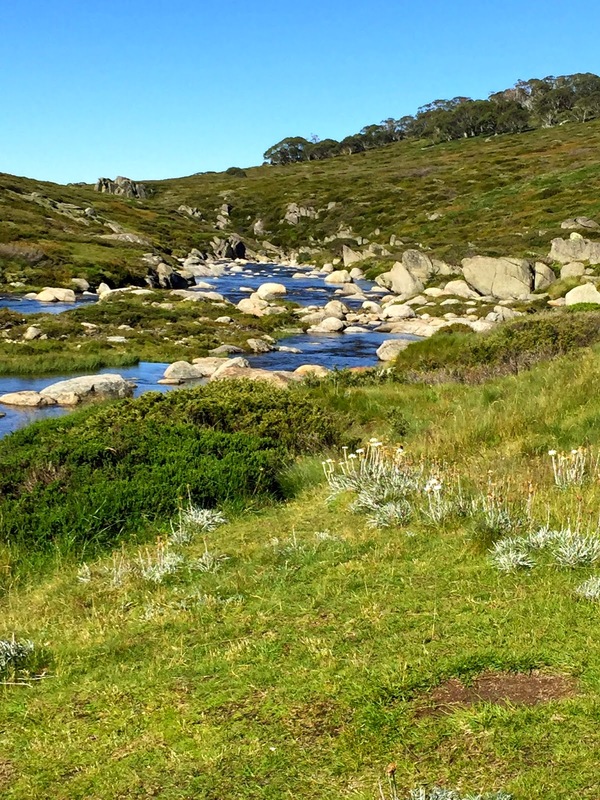 The Snowy River and he trail ahead. With Shell urging me along we made quick work of the descent. She walks with a speed and determination that is often hard to keep up with. She appears effortless in almost all terrain. My childhood memories of rivers are that of slow moving brown water. A river was either flooded and dangerous or a mere trickle with a sandy bottom which held no significant interest. Apart from the occasional secret swimming hole the river in the town where I grew up was marked by a bridge and little else. The same can't be said for fast moving water over rocks. This sound is hypnotic. The water runs crystal clear. The sun reflects so brightly from the surface it hurts the eye. These are story book rivers and I love them. 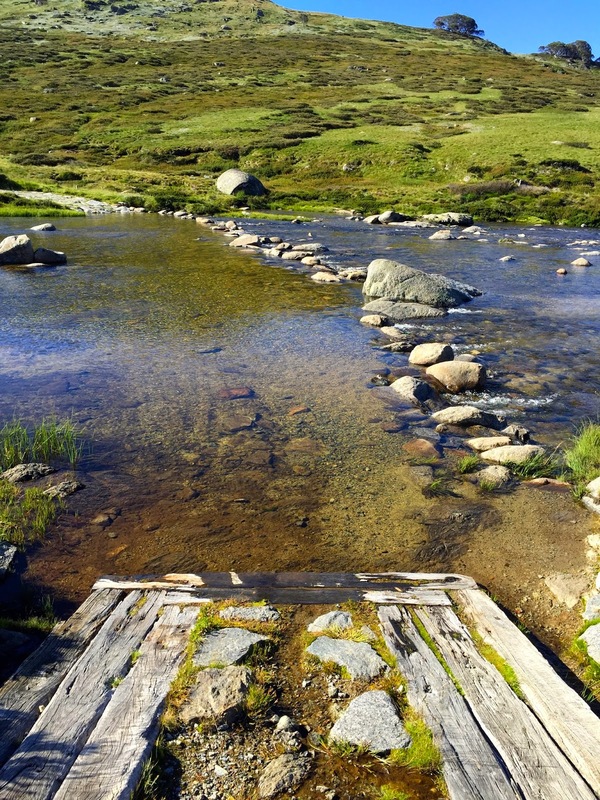 The Snowy River where we cross is one of these. As is always the case Shell insists on going point. She makes up some ridiculous reason. Something about if she were to fall I would need to carry her out or some such nonsense. Of course the real reason is simply that she likes to be first. I concede. I don't mind. I love these things about her. It humours me the way she tackles these situations and still manages to keep my macho ego satisfied. With the river low the crossing is a simple matter of rock hopping the two branches. The Main Range heads up. 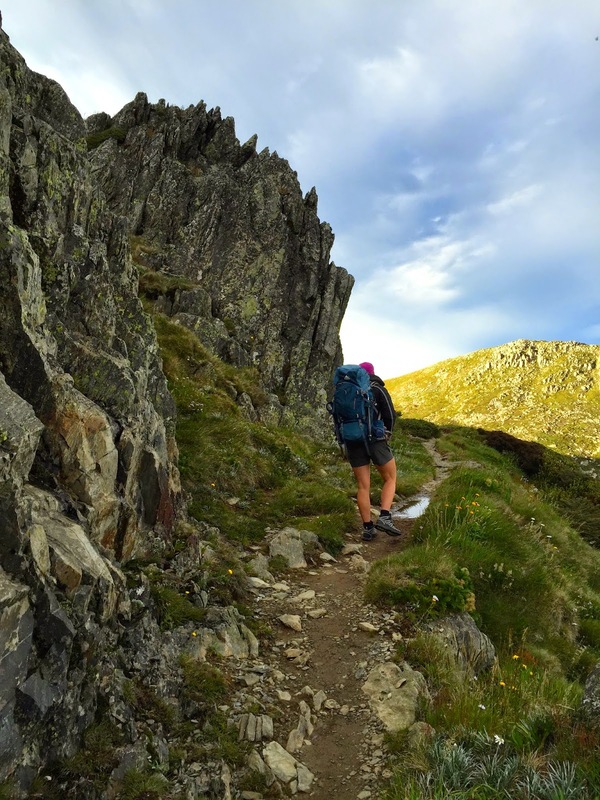 The trail is well kept and the ascent, while steady, is not challenging. 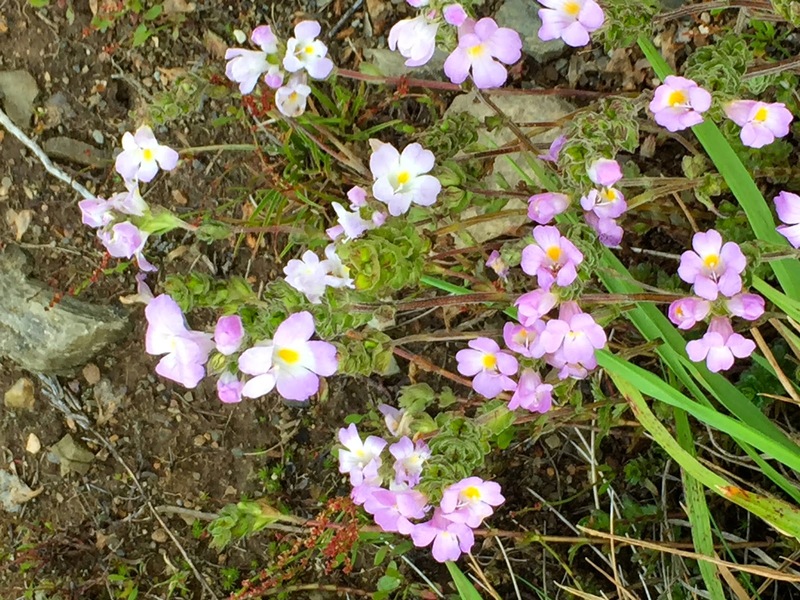 For the first time on the hike I begin to notice the wild flowers. They are everywhere. In clumps or alone. Their colours are striking against the vast spaces of green. They appear fragile and soft yet when you touch them they are hard not unlike paper. As I scanned the ridges and valleys for the glacial lakes I have read so much about it occurred to me that I should start appreciating what is under my nose rather than what is ahead in the distance. The climb continues as we head to Blue Lake. I am fascinated by these glacial lakes. The lakes are formed when glaciers flowing from the Great Dividing Range converged and carved out a basin in the granite bedrock. The surface of these lakes are frozen for about four months of the year; they overflow in spring with the melting of the snow while, during the rest of the year, the water level remains stable (information lifted from various websites). The first we come across is Hedley Tarn, though it is somewhat off in the distance. We soon cross Carruthers Creek and continue upward toward Blue Lake, the largest of the glacial lakes. We arrived at Blue Lake late in the afternoon. I can confirm it is in fact a lovely blue colour. One has to wonder at the utter lack of imagination that goes into a name such as this. I can only assume Wet Lake was already taken. We dropped our packs and took the short journey to the Blue Lake lookout. Blue Lake is 16 hectares in area and 28 metres deep. Its surface is entirely open water, with boulders reaching the shore in the east and north east, and the other shores being pebbly. 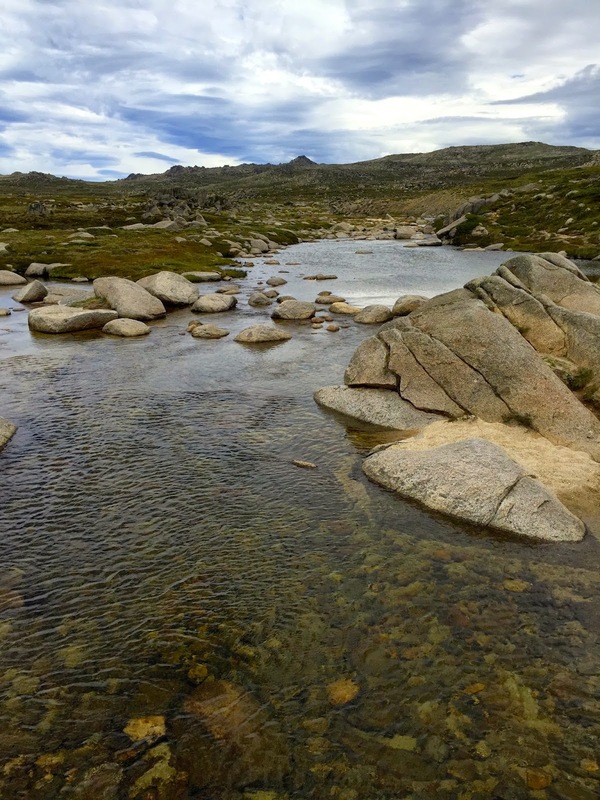 At an altitude of 1890m it is one of only four glacial lakes in Australia. Blue Lake from the Main Range Trail. Blue Lake from the lookout. The late afternoon sun casting shadows across the top of the Blue Lake valley. The trail from the lookout back to Main Range. Blue Lake is a beautiful spot. Still and serene it has a calming influence. 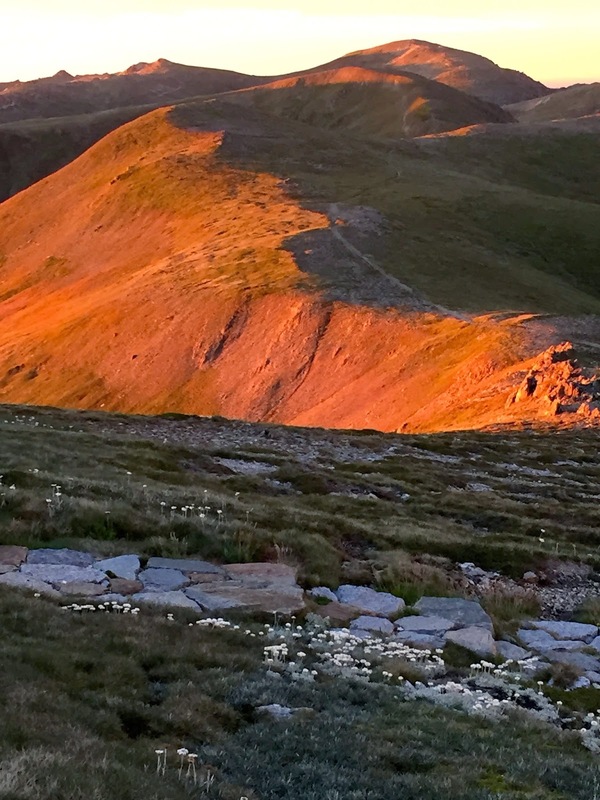 As we reached the top I checked my watch and realised the late afternoon had quietly crept into early evening. We had put around 4km behind us and it was now time to find a campsite. 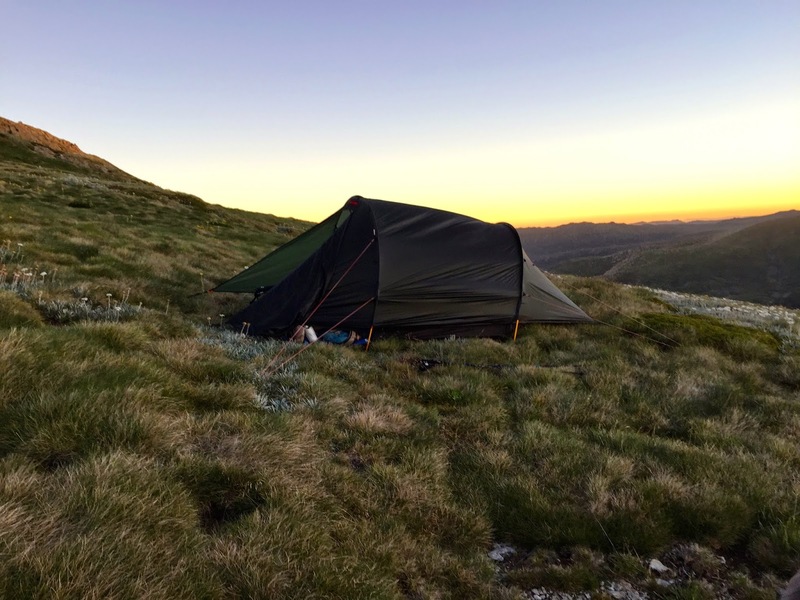 Camping is prohibited around the glacial lakes and with Blue Lake behind us and Club Lake ahead we have little option but to pitch on the ridge line in between the two. The forecast was for strengthening winds that evening. We found a semi protected spot on the ridge line just off the trail. The tent is pitched just a few moments before sunset. While cooking dinner I paused for a moment to take in my surrounds. It is amazing up here. The sheer mountains descending deep into valleys. There is no one around on the trail this time of day and that is my preference. Enjoying the solitude, the wind suddenly picked up and I look over to Shell. I could not think of another place I would have rather been at that moment. The most beautiful sight in the world. And some mountains and a sunset. The sun sets on an amazing day. I was exhausted. The days driving as much as the short hike in the afternoon combined with a full stomach had me dozing off with little on my mind. The usual thought strings and half dreams desert me and I fall straight to sleep. I awoke in the middle of the night. The wind had whipped up and the tent is making unfamiliar noises. I lied awake for a few minutes and wondered if it will collapse. I recall setting the pegs into some very soft soil. The tent seems more than capable and I drifted back to sleep. Sunrise greets us with a cold morning and light winds. Shell, as usual declares an early start is required. 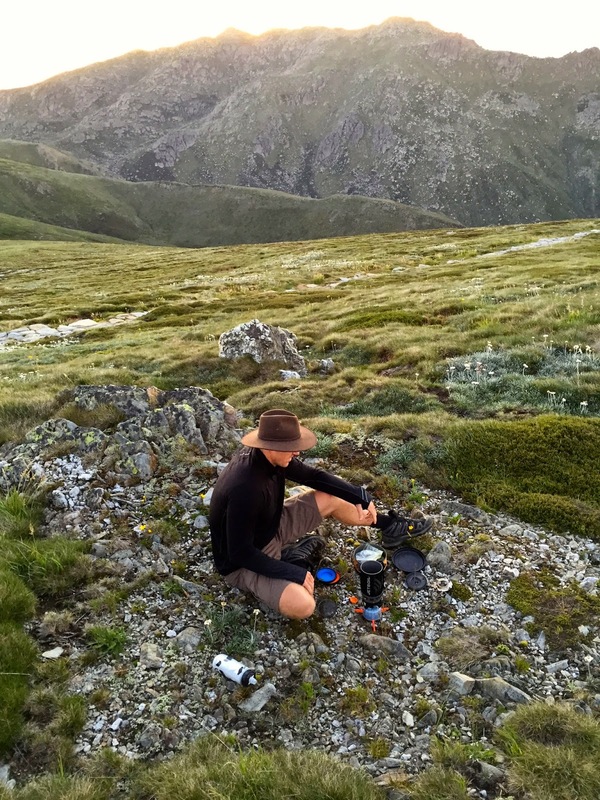 I climbed out of my warm sleeping bag at 5.00am to watch the sun rise over the mountains before I am quickly called back to start breakfast. We head out in the cold morning air. 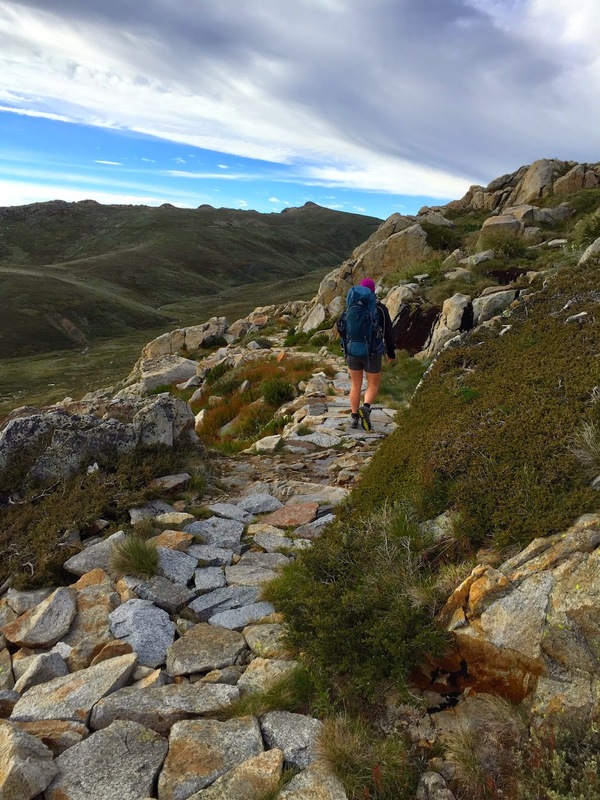 The trail is clear ahead of us and we only have 5km to Mt Kosciuszko. The steep inclines and wide trail of yesterday has given way to only the occasional slope and a narrow walking trail. We soon have Club Lake on our left. The next part of the trail becomes my favourite of the entire trip. At times the hills raise up to your left and the right drops away steeply. The views are spectacular. We soon have Albina Lake on our right. 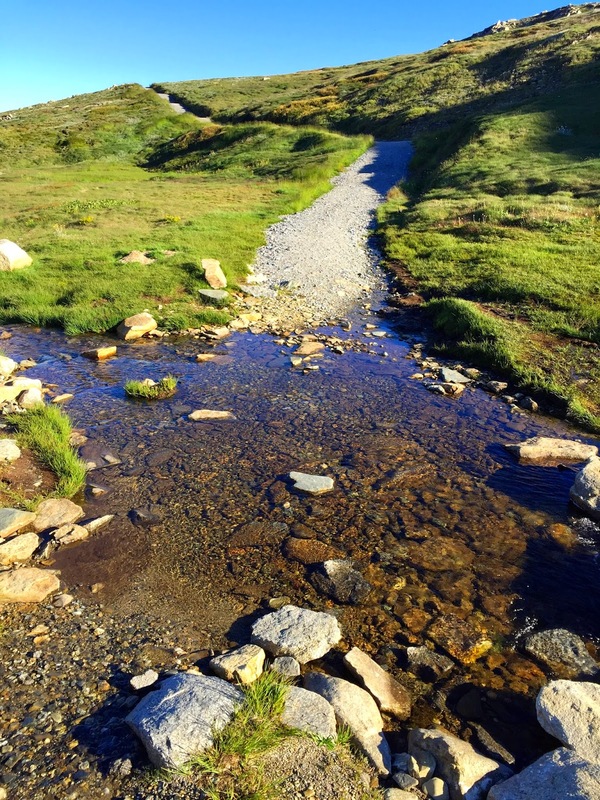 Combined with the trail, the stunning views, this glacial lake takes my breath away. As the sun finally breaks the hillside and plays over the lake we paused for a moment to take it all in. Standing with Shell in the early morning I was reminded of Carl Sagans quote Pale Blue Dot from Cosmos. I am aware of how small and insignificant I am. A nice picture spoilt by a rookie shadow error. The trail as we approach Albina Lake. The sun breaks the hillside onto Albina Lake. We continue on. The summit only a few kilometres away. We come off the ridge line to be presented with the valley we crossed earlier the day before. Lacking in the panoramic beauty on the other side of the ridge it is still quite lovely in its own right. And suddenly we were there. 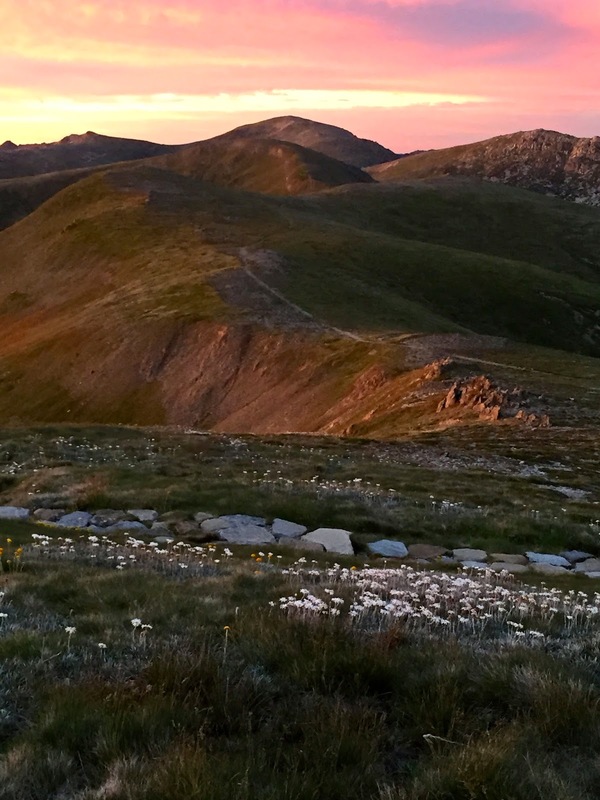 Australia's highest mainland peak may not soar dramatically to the heavens like some of the majestic peaks in Asia or South America. It may simply be a higher lump than all the other lumps in the highest part of this country. But I loved it. I was a giggling school kid when I got to the top. The views are stunning and there is something to be said for being the first person on this highest tip this particular morning. Made all the more wonderful to have got there with my amazing wife. The last bend in sight. At the summit. My first selfie. A clumsy attempt at panoramic. A not much better second attempt. The journey back on Summit Trail was a casual stroll downhill for the most part. With the scenic valley on our left we stopped at Seamans Hut for an early lunch. Apparently we invited the worlds population of flies to join us. Seamans Hut was built as memorial after the death of two skiers, Laurie Seaman and Evan Hayes. Built by the Seaman family it was hoped the hut could provide emergency shelter to prevent further tragedy. 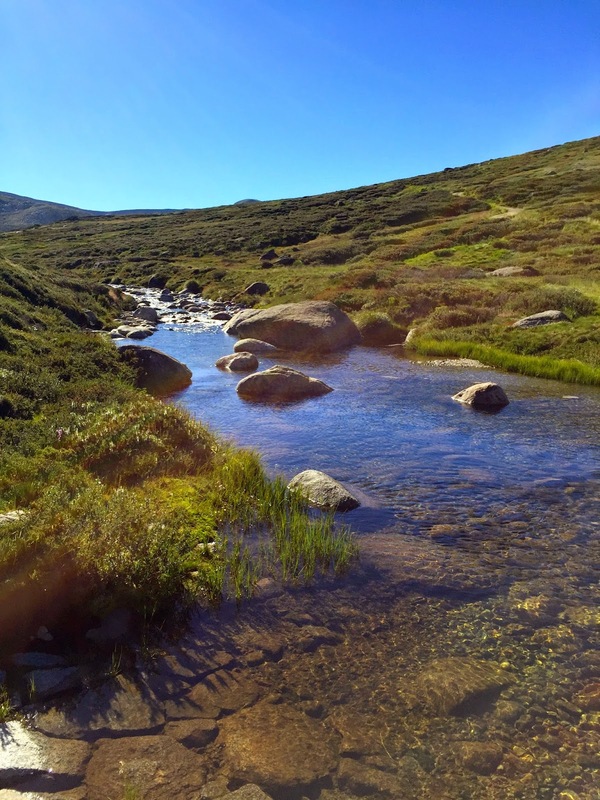 Soon we are crossing the Snowy River on the way to Charlotte Pass. As we approach the end of the trail I can make out the Main Range heading toward Blue Lake which we took the day before. Only the knowledge we are heading into the Alpine National Park in a few days prevents me from heading back onto the Main Range. The Main Range from the Summit Trail. 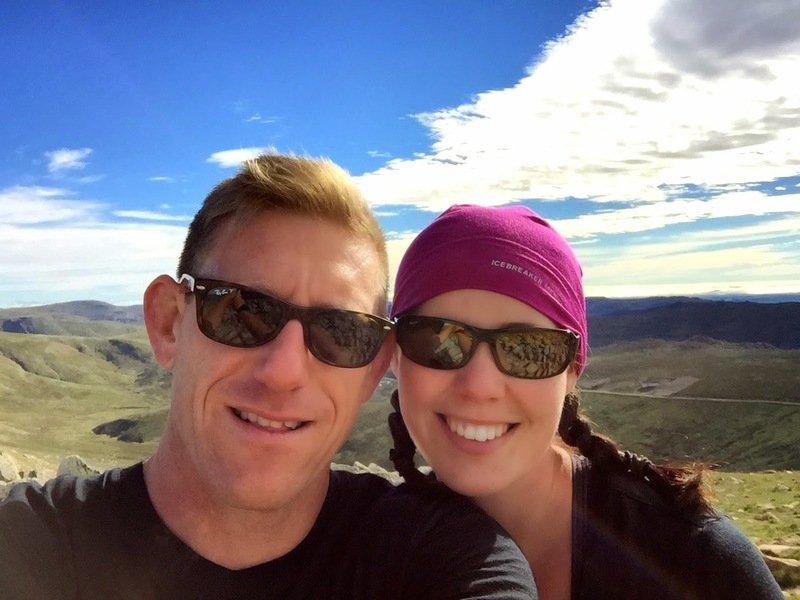 A great trip made all the more special by sharing it with my beautiful wife. If you get to the trail head early enough one could easily do this as a day trip. Cheers Taariq. You are right it can be risky up there. I kind of enjoy rolling the dice and putting faith in the tent though. A spring trip sounds great. I would love to be out there in the snow. Blog contents & photos are copyright Grant Lawrence. Permission required before publishing. Simple theme. Powered by Blogger.